How do I use myQiu? Whether you’re on the road, at your workplace or just want to train with the Qiu without a PC, you can use the myQiu Software to configure your Qiu, to import your Qiu exercises to store them in the myQiu platform and share them with your supervisor / Coach. In addition, myQiu provides additional HRV exercises on the PC for a varied training. When you connect the Qiu to the PC using the USB cable, the Qiu becomes a pulse sensor and you can perform an advanced training on your PC. MyQiu is free for a 30 day testing period. After that, the myQiu access is available from 4.16 euros / month (2-year license: 99.90 euros, no subscription). An annual license is available for 59.90 euros, the half-year license for 39.90 euros. Can I still use myQiu, if I have no Qiu? You can also use myQiu with other sensors. If you don’t need the mobility of the Qiu and only would like to train on the PC, the myQiu-Sensor represents a cost-effective alternative. The myQiu-Sensor is a USB pulse sensor and an inexpensive alternative to the Qiu for all who don’t need the mobile training with the Qiu. The included ear clip provides a reliable pulse signal. 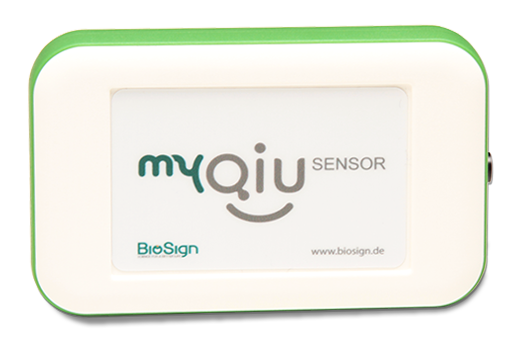 The myQiu-Sensor includes two myQiu annual licenses for the myQiu-platform. Some applications, e.g. in performance sports require an ECG-accurate HRV determination. myQiu offers the myQiu sensor plus, which is two in one: the built-in ECG allows an even more precise detection of the heart beat. For convenient HRV training, the myQiuSensor plus also features the proven pulse sensor with ear clip.